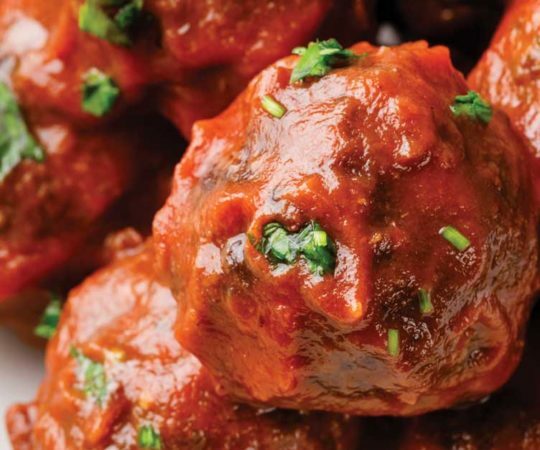 Succulent meatballs, lovingly tucked into the soft belly of crusty Italian bread and dripping in a silky sauce that sings of sweet garlic. Now that’s what dreams are made of. I love meatball sandwiches, I really do. Simple, messy, gooey, hearty comfort food. Sooo … I was having one of my meatball sandwich dreams, there was even lovely Italian café music in the background and I started thinking about how I could replace the bread and there was a ping – zucchini. And then how about the ooey, gooey cheesiness – what oh what? There was a second ping – coconut milk. 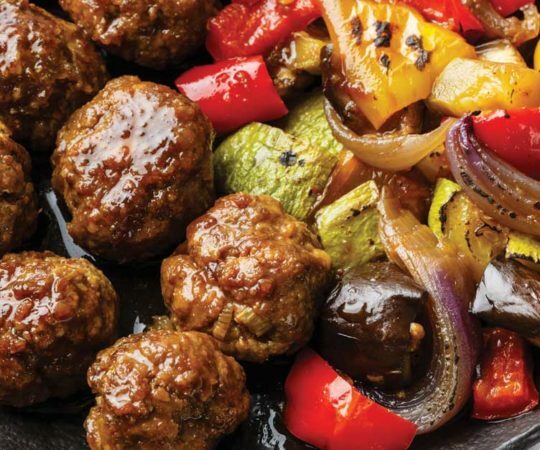 Meatballs area a paleo yes. So I just needed to run to the butcher for the ground beef and then culinary magic. Ok, let’s go. I rolled the ground meat and spice into little balls and stuck them in the oven at 350 degrees. While they cooked (and a gorgeous smell of roasting garlic wafted through air) I got my zucchini and coconut sauce prepared. I concocted a mixture of coconut milk, tomato, onion, garlic and curry powder and then sliced the zucchinis in half and created tunnels to pour the filling into. The little boats looked so full of creamy goodness I kind of just wanted to eat them raw, but I held back. Besides the meatballs were done. I only had one (and then a second one). Succulent. Yes! The zucchini “bread” smelled ready. This is what it should look like when the zucchini “bread” and coconut sauce is done. I used parsley and lemon as an edible garnish for the plate (the lemon also complements the flavor of the coconut – just a light squeeze or two). I grabbed my covered trap of meatballs and placed four or five of the little guys in each sandwich and sliced the pocket of joy in half. WOW sooo good. I was hesitant about using the coconut sauce, but man oh man does it ever work. Just as messy and comforting as the original. Yes! 1 lb. of grass-fed ground beef. Preheat your over to 350 degrees. Line two roasting trays with aluminum foil. Dice your tomato, onion and garlic. Set aside. 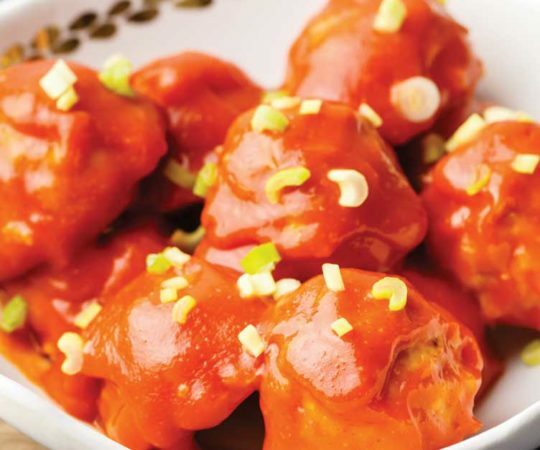 For the meatballs, crack open your egg and mix in tomato, onion, garlic, salt, black pepper and coconut milk. It's time to get intimate with your creation. Put your beef into a mixing bowl and using your hands knead in the egg mixture. Shape into lovely little meatballs and place on roasting tray and put tray into heated oven for 20 minutes. While your meatballs form into edible creations take your washed zucchini and slice them in half. 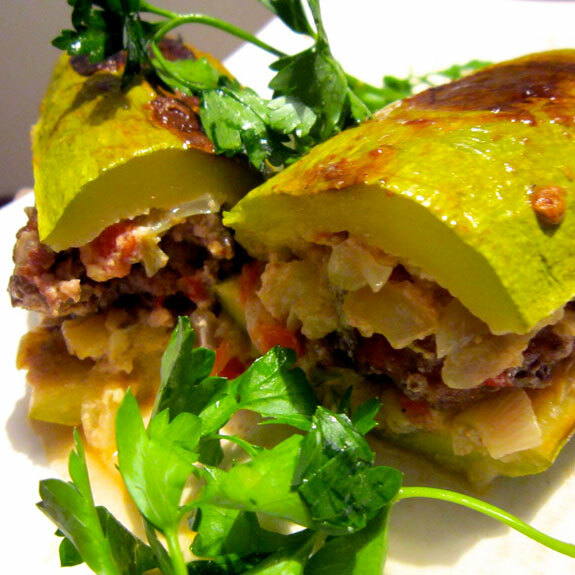 Then dig out about 1/3 of the zucchini meat on one half and ½ from the top half. Dice up the zucchini meat and add onion, tomato, garlic, salt, curry powder and add the coconut cream only (the water on the bottom is not needed so use it tomorrow for a tasty addition to a Crockpot chicken soup ). Mix everything and pour into your waiting zucchini tunnels. 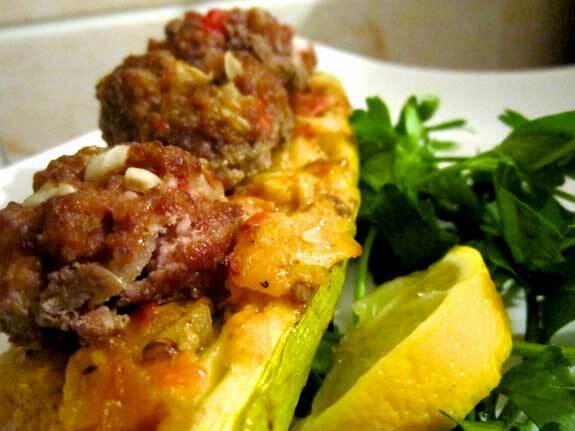 Remove your meatballs from the oven and place your zucchini into the oven at the same temperature. Cook your guys for 20 minutes uncovered and then cover them with a sheet of foil for another 10 minutes. Chop up your parsley and lemon wedges for plating. Remove zucchini from oven and sprinkle some lemon juice on top. 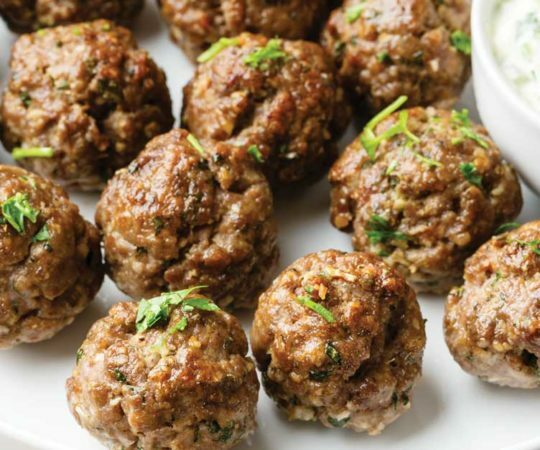 Nestle the meatballs into the deeper zucchini half place your second zucchini half on top, slice in half and serve with some parsley and lemon on the side for a mini salad garnish. I am very excited for this! I have all the ingredients. Can’t wait to try later this week! Just had this for dinner and it was great! Great flavors with the right amount of crunchy texture. We ate them open-faced and they were perfect. Thanks for the recipe! 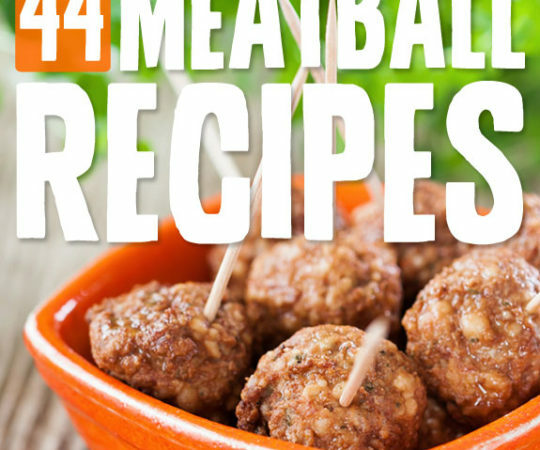 Can you make these ahead of time? If so, how should I store them in the fridge? I made this for dinner last night and was disappointed. Followed the recipe exactly, and it looked just like in the photos. I found the taste confused (the flavours did not go well in my opinion), extremely oniony, and bland. It’s possible that my zucchini was more bitter than normal, as well, because it didn’t taste like lovely roasted zucchini… but zucchini can be hit and miss, especially off season! I think that maybe a) using some tomato paste and less chopped zucchini in the filling would help this feel more like a typical saucy meatball sandwich, b) cutting out the curry powder would help the taste be less confused, and c) using far less onion and perhaps more seasoning in the meatballs would make them tastier – and maybe cooking them in a yummy (slightly sweet?) tomato glaze as well. It feels really personal to post a comment on a blog – this recipe was posted by a lovely person, not an anonymous writer for hire – so I apologize, but if others have the same experience as me, I wonder if perhaps these ideas would help? 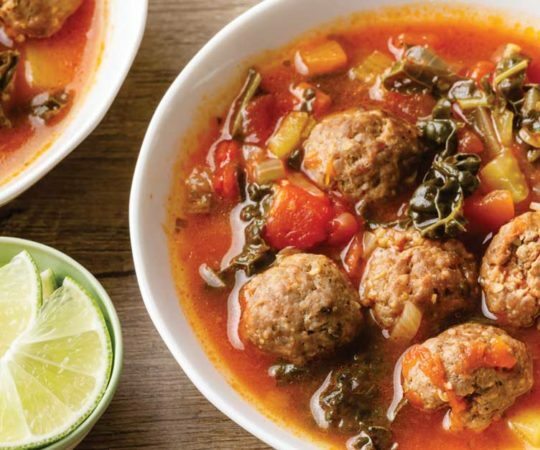 I love this recipe, my whole family does also. Thanks for giving me back the inspiration to cook & create again! I made these last night with some other meals but had these for lunch at work today and they were amazing. I had to cook the zucchini for an extra 10min and for that last 10min I put the temp up to 400. I had these with the cauliflower rice as a side and unbelievable. Will be making this again for sure. I just made this. The flavors were great, but the cook temperature or the cook time seemed really off on both the meatballs in the zucchini. I think next time I make it I’m going to up the temperature to 400. It’s all just a little soggy.